On February 17, 2017, President Trump thundered on Twitter, “The FAKE NEWS media (failing @nytimes, @NBCNews, @ABC, @CBS, @CNN) is not my enemy, it is the enemy of the American People!” Declaring the news fake and designating the media an enemy of the people establishes an ominous tone, but is it “news” — is it new? President Trump has redefined fake news, using it reactively to rebut critical media coverage without engaging with counter-claims or providing evidence. This semester I added a unit on fake news in my freshman level seminar, From Big Brother to Big Data: Surveillance Culture. In class, we explored the role surveillance plays in helping to legitimize and spread fake news. As we discussed the issue, it became clear that the term fake news is being used in two different ways. Fake news is the purposeful creation and dissemination of false information for profit, partisan advantage, or laughs. For example, Buzzfeed reports that a group of young Macedonians created “at least 140 US politics websites” that spread fake news and generated ad revenue during the 2016 election. 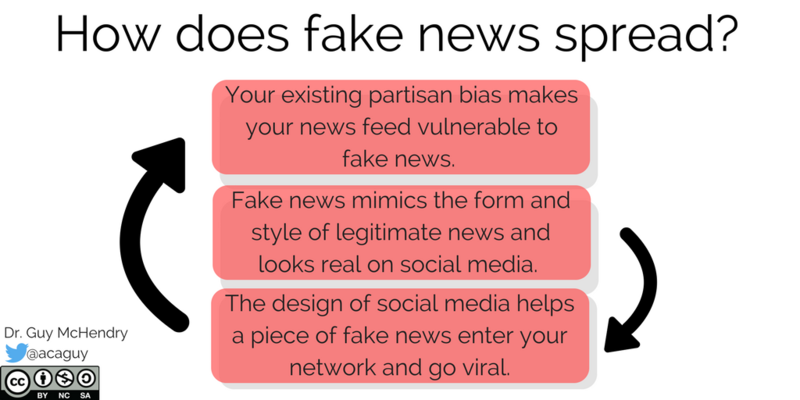 Fake news preys on partisan biases, mimics the form of legitimate news sources, and goes viral by hijacking the algorithms that control your social media feeds. Surveillance is essential to the function of social media. Twitter, Facebook, and other social networks exploit a user’s posts, clicks, and interests. These networks learn your interests and show you content that you are likely to click (often generating revenue in the process). Your feed is a representation of what Facebook thinks you want to see. Unsurprisingly, that surveillance filters in partisan stories that reinforce your biases and filtering out contrary points of view. Filter bubbles, online social circles where likeminded people bolster each other’s preexisting beliefs, create a trained incapacity to challenge alternatives views. These online echo chambers make users susceptible to fake news. You learn to trust your network and the information in it. However, it only takes one person to introduce a fake story into an echo chamber. Algorithms then spread the faux-article among vulnerable partisan users. Facebook recently revealed many users do not even open fake news stories, trusting the headline and sharing the link instead. Fake news waits for the opportune moment and then dominates a newsfeed. Shortly after the election, the left began arguing fake news aided Trump’s election. Popular examples of this phenomena include allegations that Clinton was involved in a pedophilia ring, that the Pope told Catholics not to vote for Clinton, or that an FBI agent investigating Clinton’s emails was murdered. Such stories overwhelmingly benefited Trump. While the narrative that fake news helped tip the election is inviting, recent analysis suggests the overall impact of these stories was likely very limited. Fake news offered a convenient narrative to explain Trump’s election, regardless of its actual impact. According to Google Trends, interest in fake news increased steadily after the election (especially between November 6 and December 10), before dissipating abruptly. However, something changed in early January. Between January 8 and 14, interest in fake news increased sharply. It was in that same period that the President began using the phrase fake news. However, President Trump’s does not use fake news to identify fabricated stories. 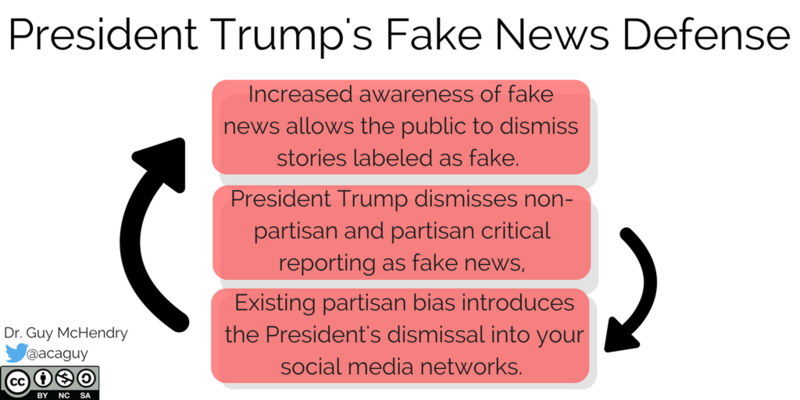 President Trump frequently dismisses negative media coverage as “fake news,” “FAKE NEWS,” or “#fakenews” without arguing the substance of a critical story. Beginning January 11, 2017, President Trump has used the phrase on twenty distinct occasions on his Twitter account alone. When faced with scrutiny over the President’s labeling of critical coverage as fake news, CNN reports deputy assistant to the President, Sebastian Gorka, argued that until the media ceases attacking the president they, “are going to continue to say, ‘fake news.’” Fake news is one of the administration’s favorite rhetorical devices. The public furor over fake news gives the term legitimacy and potency at undercutting or dismissing stories that get labeled as fake. This urgency removes the need to use fact-checking websites (like PolitiFact or Snopes) to debunk a story. The term functions as an immediate rebuttal. Naming something as fake news dispenses with the difficult work of refuting claims, mustering counter-evidence, and generating responses. When President Trump declares that something is fake news, he avoids dealing with the content of an article. President Trump weaponized fake news and the same partisan desires that fuel false stories during the election enable the President. Partisan beliefs drive our acceptance or rejection of the President’s claims. Alternative facts (#alternativefacts) take root, dismissing non-partisan and partisan criticism of the President. President Trump generates an alternative knowledge economy, acting as the arbiter of truth. In this economy, dissent does not need to be acknowledged or countered. As President Trump thunders from his bully pulpit, it is essential to stop the dismissal of critical coverage at its face. The president can act as a thought leader, but he cannot become the sole arbiter of truth. Leaders set priorities and enact policies; authoritarians authorize truth.